Mercenary Voyages: Ahoy, me hearties! 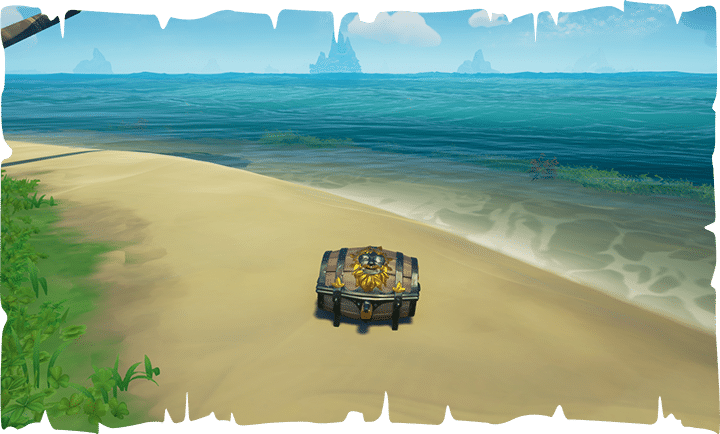 The first Bilge Rat Adventure of 2019 has just arrived to the Sea of Thieves! This Bilge Rat Adventure will have you completing one of the brand new Mercenary Voyages that Duke is selling at every Outpost for five doubloons. Starting the game fresh with zero currency? Don’t fret! Upon launching into your first session of this new update new players will be gifted five doubloons to participate in at least one Mercenary Voyage. These lucrative new voyages will have you completing every adventure that the three different trading companies have to offer—all in one package! You can think of a Mercenary Voyage as a small sampler of your typical Sea of Thieves pirating session. 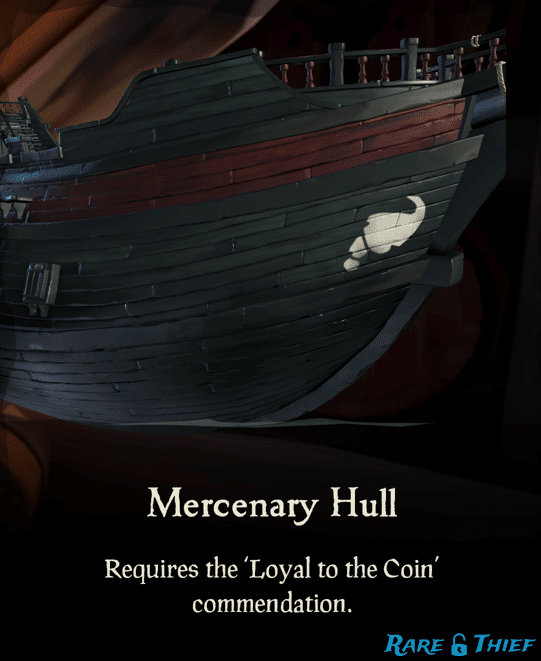 Complete a Mercenary Voyage and you will unlock the Loyal to the Coin commendation. 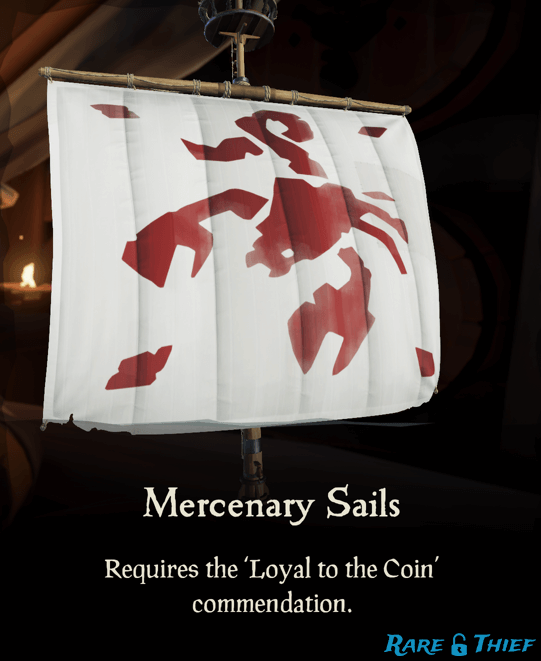 This commendation will grant you access to purchase the Mercenary Sail, Hull, and Flag! Four different quests comprise one grand Mercenary Voyage: one X Marks the Spot, one Riddle, one Order of Souls, and one Cargo Run. For the X Marks the Spot quest, you will be given a map of an island with one or more red X’s on it. You are not given the name of the island. You will need to use your image matching abilities to locate it. It can be a bit tricky locating the island on your ship’s map table. Not to worry. 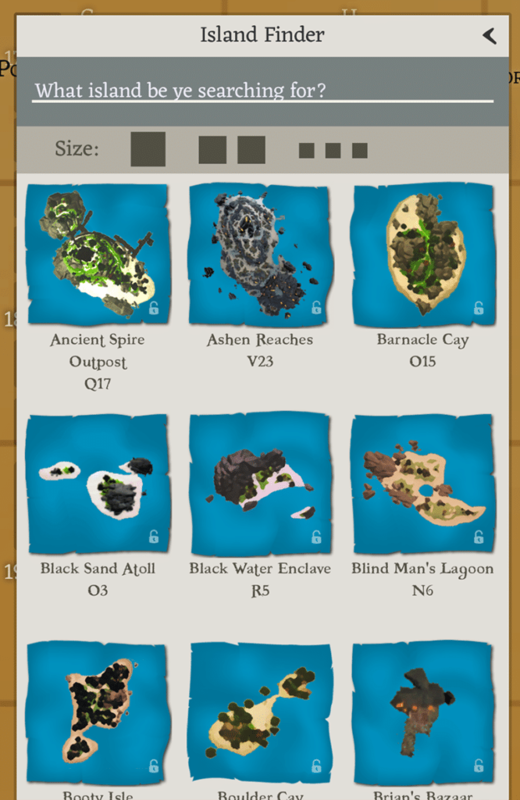 You can always use the Island Finder feature on your interactive map. These islands are a bit larger, allowing for an easier and quicker comparison. Simply click on the icon to the left, and you will be shown a panel that you can scroll through to find the X-bedecked island. Once you make your way to the island, you will use your shovel to dig up the treasure at each X. You will also be receiving a Riddle quest. 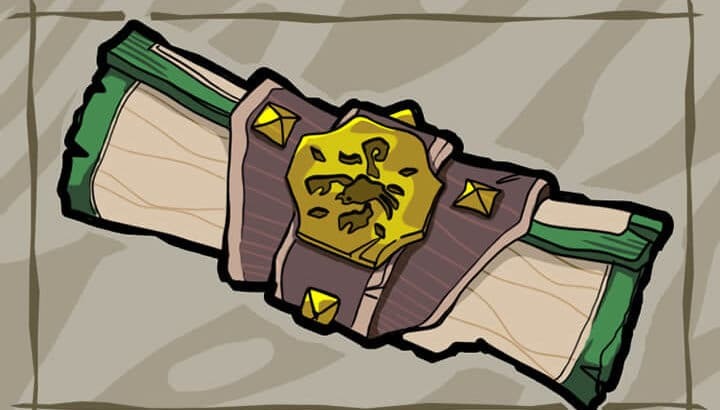 These quests will have you running around an island looking for prominent landmarks or rock paintings. If there is a step in the riddle you are stuck on, this would also be a good time to open up your interactive map. Simply search for the riddle you are stuck on. Where is that blasted “Derelict Barrel Cache” on Sailor’s Bounty? 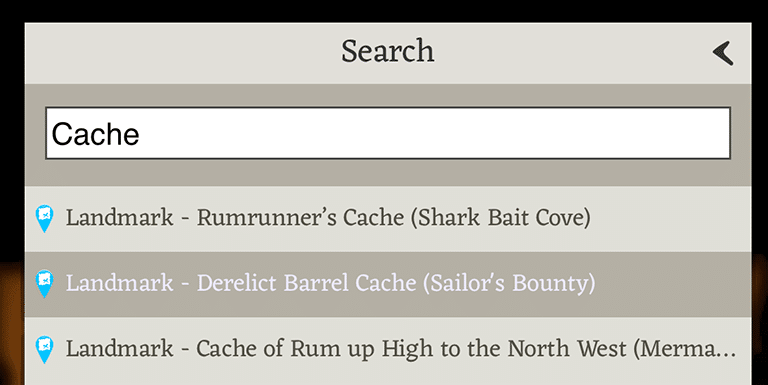 Click on the icon, type “derelict barrel cache” into the search, and you will soon see exactly where the cache is on the map, plus an image to help you know what to look for. You will find another quest in your inventory: the Order of Souls quest. This quest will have you killing one or more skeleton captains on an island. You will know which skeletons are the captains because they will have an orangish-reddish title above their head. Plus, upon their demise, captains will drop a skull that you can turn in for loot! During your Order of Souls quest, you will encounter several types of skeletons. If you come across gold skeletons, you will want to lure them to water or douse them with buckets of water. This will make them rusty and easier to kill with your guns. Swords don’t do very much damage to them. Mostly, swords will simply buy you time while a teammate finds an ammo crate to reload (you can also find ammo crate locations on the interactive map). Generally speaking, if you’re fighting the “Golden Girls” you are better off using a pistol, Eye of Reach, or blunderbuss. You might also cross swords with leafy skeletons. Leafy skeletons are best fought with your trusty cutlass! Do not lure these skeletons into water! Water heals them. Guns do work on the leafy skeletons, but guns are not as effective as swords. Shadow skeletons are only a problem at night. They will be invincible to any kind of attack at night—unless you first shine them with your lantern. Then they will be vulnerable to swords, guns, and explosives barrels. Pick your poison! The final quest type in this grand adventure will be a Cargo Run for the Merchant Alliance. You will be picking up pieces of cargo from an NPC who resides on the island the voyage states. You will then deliver this cargo to another NPC. Once you pick up your cargo, you’ll know to whom you should be delivering by reading the note on your cargo. Again, if you are having trouble finding said NPCs, you can use the handy interactive map to locate them. You can select “Cargo Runs” from the Filter to see all Cargo Run NPCs. If you’d like to be a bit more specific, you can type their name into the search. Simply click the icon, and type in the name. You can then click the result, and you will find their exact location—and you can plan your docking appropriately. After you complete the four different quests you will be given one final X-Marks-the-Spot map. This map will lead you to an island with several Chests of a Thousand Grogs! You will have found the Rum Runner’s stash! Huzzah! Congratulations on completing your first Mercenary Voyage! 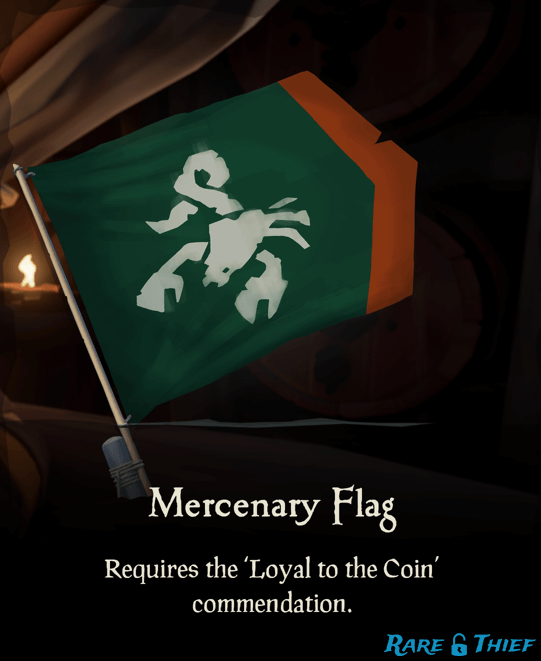 Sit back, have a grog, enjoy your new ship cosmetics, and your hard earned doubloons! Thanks for the guide! Our crew just finished the mission and received a new style for our ship.